Are you a good neighbour? Of course you are! Much of our countryside wildlife depends on areas that are bigger than a typical individual farm. Tree sparrows regularly flock three to four miles from their nesting sites to sources of winter food. A barn owl’s home range can be 12,000 acres in winter. Species that can’t move far need networks of ‘stepping stones’ of habitat. Small blue butterflies struggle to disperse more than a couple of miles, and for non-flying species such as harvest mice, being able to scamper directly along ‘corridors’ of cover is crucial. Conservationists now talk about this concept as ‘landscape scale conservation’. They recognise that tiny nature reserves scattered across the country will never be enough to sustain most species and the larger ecosystems they make up. Making spaces for nature that are ‘bigger, better and more connected’ has become the major approach to helping wildlife recover and be resilient to outside change. Over the last few years farmers up and down the Upper Thames river valleys have been working with me on exactly this principle. An individual farm might have a patch of wet grassland, or a traditional hay meadow. But it’s the presence of both these habitats, strung along the floodplain between nearby farms, which make this area nationally important for specialist birds such as lowland curlew. But the surprise lesson we’ve all learned is that joined up working between neighbours doesn’t just benefit the birds. There can be economic advantages to working collectively at a bigger scale. Pollarding a handful of willows might be quite expensive, but offering a contractor a larger amount of work in an area spreads out the overhead costs and often means everyone gets a better deal. When any group of people come together, we’ve found different people have different strengths. There’s often been someone with a particular expertise, specialist equipment or range of useful contacts that others might benefit from. 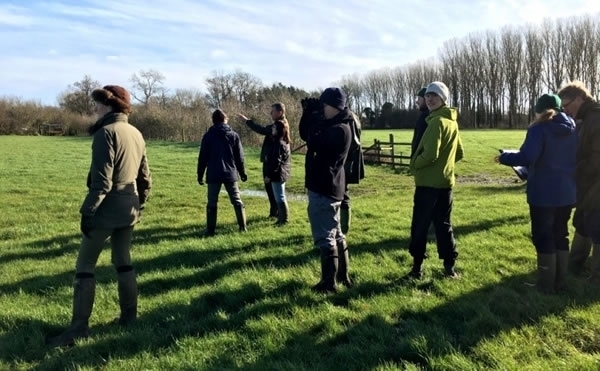 When farmers in the group have shared what conservation they’re each doing on their farms and where – across their shared landscape – it’s given a new perspective. Each can clearly see how their meadows, pastures and arable conservation features relate to each other, where they align, and where the gaps are. So what has this got to do with the Big Farmland Bird Count? Well, this year Big Farmland Bird Count results entered online can be recorded against a particular farmer group. Results from all group members taking part can then be collated, tracked from year-to-year and shared. Whilst it might be tempting to compare results to see who is attracting the most linnets (and why not?! ), if you’re part of a local group or cluster, this new functionality will let you see quickly and easily how wide-ranging winter flocks of farmland birds are using your shared landscape. So whether we’re farmers or finches, we all really do need good neighbours. Taking part in the Big Farmland Bird Count is a great opportunity to be reminded that our landscapes are shared not only with a wealth of wildlife, but with each other. Next Next post: The Big Farmland Bird Count is back, back, back!